before making your booking, please read through the following Terms & Conditions carefully as upon purchase you agree to the terms and conditions as shown below. Please note that we can only book an entry / a massage after payment has taken place as massage hours are limited and payment needs to be made to secure each reservation. You can make your booking by filling out the booking form on the left. If you change your mind about the day of the visit, please notify us minimum 72 hours before your booked visit, and we will try our best to make adjustments to suit your needs (subject to availability). If you have any preferences / (dis)likes, please do let your massage therapist know before the massage treatment begins. Please bring your confirmation email (identical with the digital voucher) with you on a digital device or printed on paper to fasten the check in process. Once payment has been made, there is an automatically generated confirmation email, which is sent to the email address you provided in the booking form. If you do not see the confirmation in your inbox, please check the spam/junk folder of your mailbox. For further assistance, please contact us via email at info [at] szechenyispabaths [dot] com. Massages can only be booked for guests of minimum 18 years of age. Proof of age may be required. Massage treatments are available to be booked between 10am and 6pm on any given day (exceptions are national holidays like Christmas). You can add your preferred massage hour in the booking form, but this is a preference not a guaranteed hour. Appointments are subject to availability. Once you make the payment, we will book you in for a treatment, which is the closest to your preferred hours. The booked massage hours will be sent to you in a second confirmation email. If you should find the hours unsuitable for your needs, please contact us via email at info [at] szechenyispabaths.com to re-arrange (subject to availability). Before and after the massage hours, between 9 am and 6 pm you are free to use the thermal pools included in your ticket. The only important time is that you have to be at the massage treatment check-in point 1 hour before the massage begins. Check-in with online fast track tickets is to take place between 9am and 6pm only. Guests arriving after 6pm will need to purchase a new ticket on the spot, without the right of any refund. If you wish to check in after 6pm please buy a standard bath ticket on the spot at the cashiers, and do not book a peak time online fast track ticket. Please bring your confirmation email (identical with the digital voucher) with you on a digital device or printed on paper to fasten the check in process. Check-in with online booked massages is to take place between 9am and 6pm only. Please check in at least 1 hour before the confirmed massage hour, so that you can be ready in swimwear by the time the massage hour begins. Massages are automatically cancelled – without a right to refund – if guests do not check in min. 40 minutes before the massage begins. Make sure you do not lose your massage and money. Please bring your massage confirmation email (identical with the digital voucher) with you on a digital device or printed on paper to fasten the check in process. Acceptable swimwear is to be worn including: bikini, tankini or one-piece swimsuit for Ladies, swimming briefs/ trunks/shorts for Gents. Full body swimwear (e.g. burkini) or flimsy swimwear (e.g. thongs) are, unfortunately, not allowed to be worn in the thermal baths. Swimming caps are mandatory in the swimming lap pools, but not required in the thermal soaking pools. Swimming nappies are not allowed in the pools, only children who have been potty trained, and therefore can safely wear a swimwear can use the thermal baths (younger ones can stay with their parents outside the pools though). The order cannot be cancelled. If you wish modify the day of your visit, please let us know minimum 72 hours before your reserved date, and we will try our best to adjust the date/hour to best suit your needs (subject to availability). Non Arrival: if you could not make your pre-booked visit, there is no refund unfortunately. There are no refunds for unused vouchers. You can request changes in your booking (e.g. number of tickets) min. 3 days before the date of your reservation. Within 72 hours the booking may no longer be modified or cancelled. With any further questions please contact us via email at info [at] szechenyispabaths [dot] com. Please note that we reserve the right to charge an additional amendment fee to cover administrative costs for completing changes requested in dates / hours, etc. The thermal bath area is a strictly splinter free zone. Guests are not allowed to bring in glass bottles in or near the pool areas in the thermal baths in order to upkeep a splinter free zone for public safety reasons. 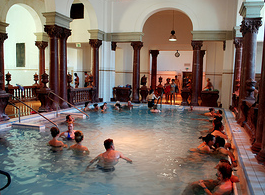 Children are to be under adult supervision (1:1 ratio) when using the pools in the thermal baths. Children/ babies who are not potty trained yet are not allowed in the pools, not even if they are wearing a swimming nappy (they can stay outside the pool area and will be allowed to enter the facilities, but please make sure that they do not enter the pools). As the thermal baths are a relaxing area only reasonable and appropriate behaviour is tolerated (please maintain reasonable noise levels and avoid being too intimate). Most guests visit the baths to have a quiet relaxing time in/ around the pools. Please respect every guest’s stay by actively maintaining a friendly, acceptably quiet zone. Out of respect for the privacy of all bath guests, and the restful atmosphere in the thermal baths, which we are trying to promote, neither mobile phone cameras nor standard cameras are permitted to be used in the thermal baths. Please make sure to use your mobile phone responsibly to avoid any inconvenience. There are signs in the thermal bath area indicating what is / is not allowed in the pools. Please follow the instructions accordingly. By renting a towel from the thermal baths you accept to return it, upon which you will get back your deposit for the towel / bath sheet. If the towel is picked up by another guest unfortunately the bath cannot take responsibility. Please make sure to take care of rented items (towel, swimwear, bath robe, etc.) from the baths to be properly entitled to a deposit. When purchasing the ticket you accept to be in a healthy condition for the safe use of the pools and pool areas. Guests under intoxication (drunk/ dazed) will be refused to visit the baths. Please use the showers before going into the pools to make sure to wash away the dust and sweat from your body before entering the pools. Please do not bring any unguarded valuable items to the baths as the thermal baths have thousands of visitors, which makes it more challenging to protect your own values if you are staying in the pools. No responsibility can be accepted by the thermal baths for the safety of money or valuables, whether placed in a locker or not. The thermal bath will not be liable for damage, injury or loss caused to the guests or their belongings. Smoking – of traditional and e-cigarettes, tobaccos – is not allowed in the thermal baths, which is a non-smoking establishment. 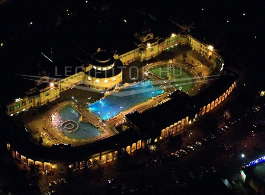 We advise against the excessive consumption of alcoholic drinks prior or during your visit to the the thermal bath. The baths reserve the right to refuse admission. Due to the natural warmth of the hot spring waters in the baths, and the heat of the steam rooms, we strongly recommend that you drink plenty of water / healthy fluids during your visit. Water fountains are freely available, and the tap water is suitable for drinking. Guests with medical conditions / taking medications are to consult with their doctor in advance if they are safe to visit the thermal baths. If you have a known allergy or suffer from a medical condition such as high blood pressure, diabetes or have had cancer within the last 5 years, please consult your doctor. 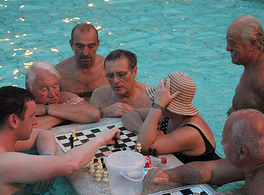 There is no resident doctor for guests in the thermal baths (only for patients in the thermal hospital ward). Following your doctor’s advice, please notify us of any condition of which we should be aware, prior to completing your reservation, or if your medical condition subsequently changes after your booking has been made. We reserve the right to request and view a doctor’s letter prior to entering the Spa or providing a treatment and, if necessary, to refuse the treatment on medical grounds or ask that you sign a disclaimer. Please make sure to keep up a clean and tidy thermal bath area. Please use the litter bins for any rubbish as you would wish to be yourself in a clean thermal bath rather than a littered area. For the same reason, please notify the staff if you see other visitors who do not follow the tidiness regulations. Please make sure to cover your skin with sunscreen protection during the hot sunny days (which may range from April to October), and seek shade whenever possible. 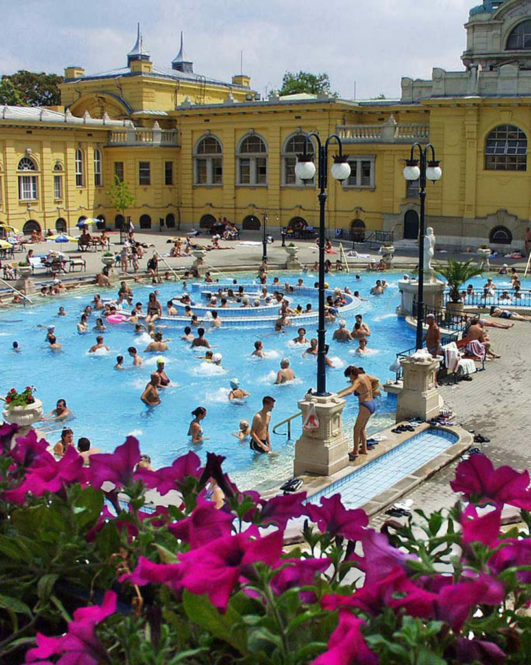 Unfortunately, the use of hot spring water thermal baths in Hungary is not recommended for pregnant mothers as the warm waters may affect your pregnancy (inducing cramps). Therefore, use of the pools is at your own discretion up to week 32 (after that it is strongly not recommended). We strongly advise you do not use the massage jets. 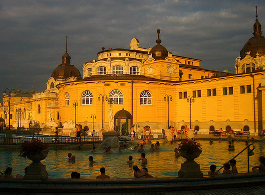 Pets / animals are not allowed in the thermal baths and spa areas. The smart wristband you receive upon entering the thermal bath serves to use the locker and the changing cubicle (cabin). Please note that there is a charge for the loss of a Smart WristBand (aka the Proxy watch). 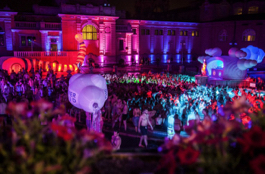 is there an age limiting in czechenyi nights party? guests under 18 years old are not allowed at the Sparty. Hello, if I have an early flight on Sunday, and plan on going to the airport after the Saturday Bath party, can I place my luggage in a private cabin that we rent? Is there a baggage restriction for the baths? you would need to buy tickets that includes cabin usage. Have a great time in Szechenyi Baths Budapest. Can I simply just say what a relief to find somebody who really knows what they’re talking about on the web.